Mmm, mmm, mmm...there's nothing better than good ol' fashioned Creole jambalaya: hearty, filling, chockful of veggies and rice, and...veggie sausage! 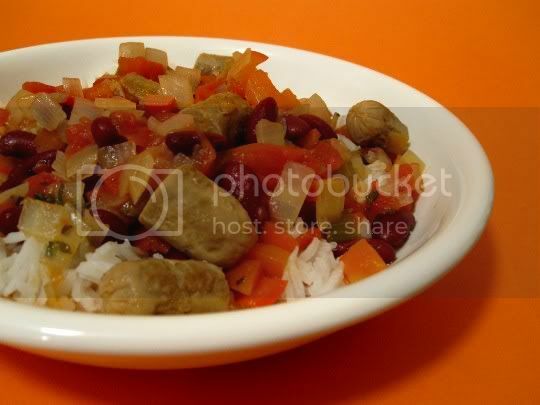 Jambalaya just isn't jambalaya without sausage, but the veggie kind does not fail in this dish. And of course anything the requires minimal cooking (i.e., throwing a bunch of stuff into a pot and simmering until done) is fine by me. Onions, celery, red bell pepper, and garlic are sauteed, then simmered with diced tomatoes and fresh thyme, marjoram, salt, and hot sauce for seasoning. The recipe calls for fresh marjoram, but I couldn't find this in two different stores, so I just halved the amount and went with the dried kind. If you want more heat, try doubling the amount of hot sauce used (or, just add it at the end). Two cups of water are also added; if you want a finished jambalaya that's thicker, you may want to start out with one cup. Sauteed cut-up veggie links, kidney beans, and fresh parsley are added toward the end of cooking, and of COURSE, this must be served over rice. I think something about the flavor combination of the bell pepper and veggie sausage adds a strange seafood-like taste to this dish: not strange in a bad way, but strange in a good I-can't-believe-this-has-no-meat-in-it kind of way. The end result is so full of tangy tomato flavor, so hearty, and so aromatic...and as you can imagine, leftovers are even better! Make again? Definitely. Another good one for convincing the meat-eaters. "Jammin' Vegetable Jambalaya," The Vegetarian Meat and Potatoes Cookbook, Robin Robertson. Boston: Harvard Common Press, 2002. I thought you were supposed to double the amount of spice when you use dry instead of fresh? Actually, the ratio is usually 1 teaspoon dried to 1 tablespoon fresh. Contrary to what most people think, the fresh herbs are more mild while the dried ones are more concentrated. For that reason, you'll notice in most recipes that when using dried herbs, you can add them during cooking; but use fresh, and you usually add them in at the end (so all the flavor doesn't cook out). Try it and see!